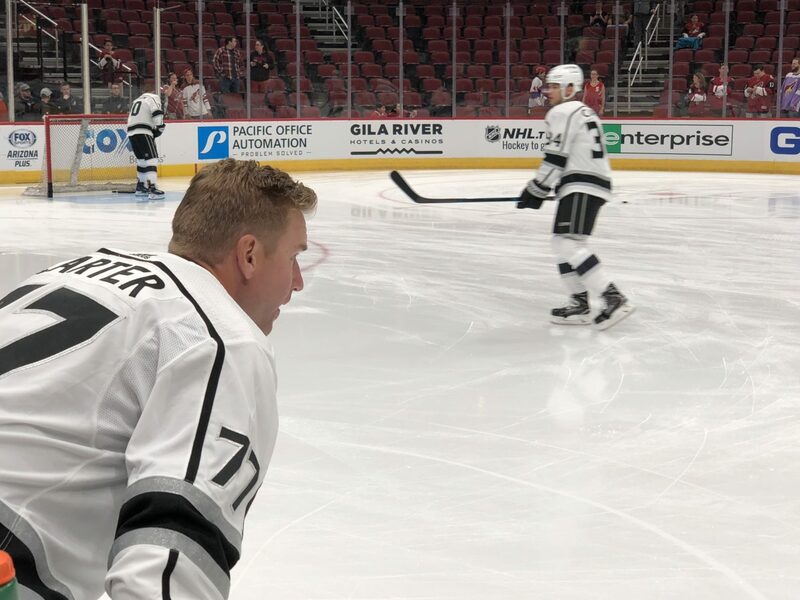 In the Glendale, Arizona split-squad game, the LA Kings lost 4-2 to the Arizona Coyotes after falling behind 4-0 through the first 21:44 of game action. All goals were essentially scored during special teams time; of the two even strength goals scored, one was scored by Alex Galchenyuk right after the conclusion of a Kings power play, and one was scored by Jeff Carter during four-on-four. Galchenyuk’s second was a 5-on-3 goal and Carter’s second was a 6-on-4 goal on a delayed penalty. In other words, it was a typically special teams-heavy early preseason game. Dion Phaneuf appeared in 17:28 through the first two periods and did not return for the third, but Assistant Coach Dave Lowry, who ran the bench with John Stevens in Los Angeles, didn’t express any alarm. “Dion’s OK. We just took him off for precautionary [reasons],” he said. I liked when we got the puck to the goal line. We started creating some opportunities. It allowed us to establish some zone time. I think what you have to do is you’re trying different guys in different spots to see if they can handle the work, and for us, we had some guys that were killing penalties that maybe they don’t kill in the regular season. It’s opportunity, and what you want to see here is you want to see some guys take advantage of it, but for us what it does is it allows us now to go back to work. Now we have some live footage, now we can go back and really break down where we got hurt and where we got beat. I liked him offensively. He hung around the net on the first one, and the second one, that’s a goal scorers goal. You know that every game he’s going to get better. He missed a real good chunk of last year. He came back not at 100%. Right now he’s just getting himself ready for the regular season and every game brings him a step closer. I see a real improvement in that first step. Right now, he’s showing that he does have the ability to pull away from guys, and that’s a credit to the work he did this summer. Yeah, I think so. I mean, the main thing was special teams tonight. Other than that, I don’t think we gave up a lot of five-on-five chances. It’s the first game, so everyone’s going to be a little nervous or a little jittery, but I thought we played well. Obviously, we can play a lot better. But it was a good showing for game one. I think so. Usually in the preseason we’re rolling lines, so everyone’s getting their ice time. But just the fact of getting used to the game again, getting used to where everyone is at on the rink, it’s tough for the first game of the season. But I think as the game went on, we got better and better, so that’s a good sign. That’s something we can take away from. I thought I moved the puck quick and was good defensively. One thing I need to work on, I got beat a couple times on the penalty kill there in the first period. That one play where we went backdoor, that’s on me. That’s not on Soupy at all. Other than that, the game was good. It’s what you just said – just getting sharp and working on my details. I’m sure Billy will have some stuff for me. Ifelt pretty good but I’ve just got to keep dialing it in more and more and just learning from a couple of the goals. But, move on, watch the tape and just get better every day. I thought the guys did a good job for me. It’s just making sure my details are all perfect. I’ve just got to keep working on them, and I just kind of made a little mistake there, committing to the other side. He made a nice play on the second goal. But something like that I can learn from and just get better at.